Love DIY projects? Oh do I have a bunch for you to day. 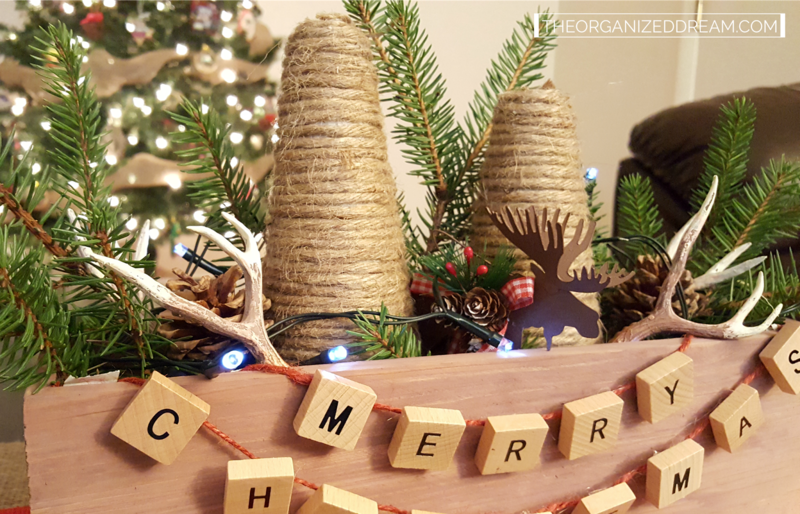 Once again, I've teamed up with Oriental Trading and I have great ideas to get into the Christmas spirit while adding a little rustic charm to your home this holiday season. I will list everything with links as to exactly what I purchased at the bottom of this post. For now, let's get to it! 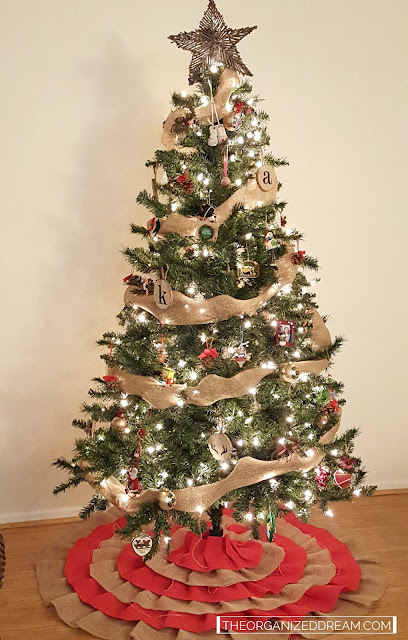 I've completely redone my tree this year to add a little bit more of a country, rustic look and I am absolutely in love with the way it came out. I've received quite a lot of compliments. These little pine cone cuties were made by simply taking a small pine cone, a piece of red jute and hot gluing a burlap bow I made by hand. It was fun to make a bunch of these to throw onto the tree to add a little bit of woodsy fun and a pop of color here and there. 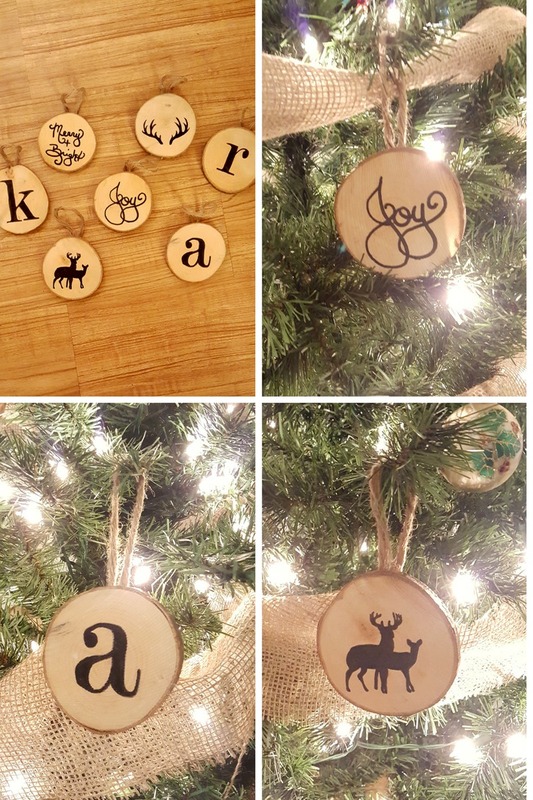 I also created the ever-so-popular wood slice ornaments made by stenciling the designs and tracing and filling them in with a black paint pen and sharpie. 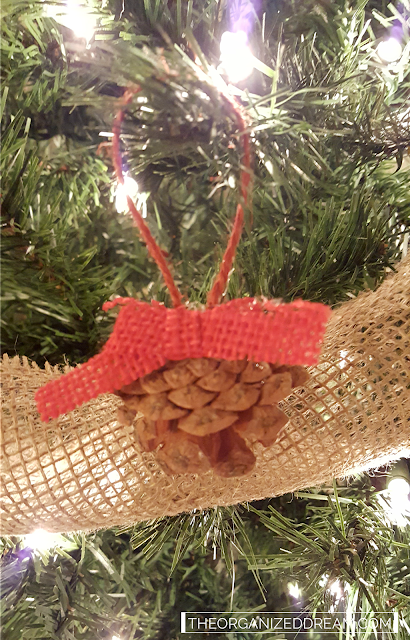 I used thick jute to hang them on the tree and it works out great. You can check out how I stenciled the designs and monograms here. 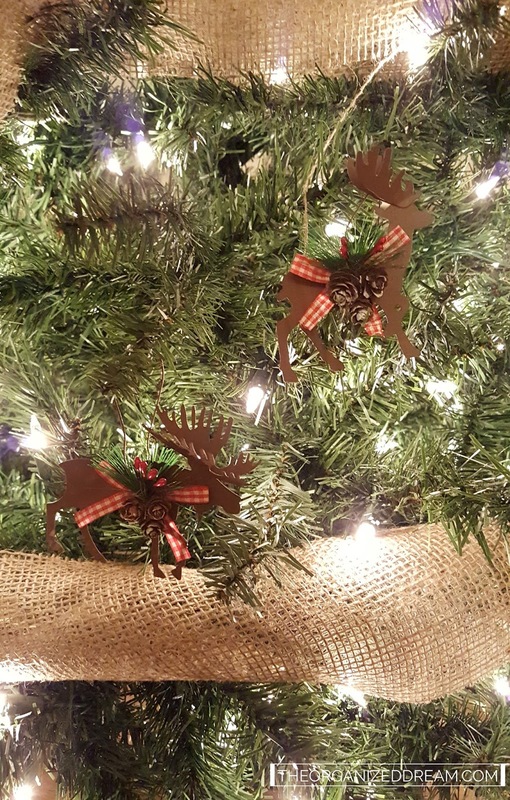 Oriental Trading had these adorable metal deer and moose ornaments. I was a little disappointed when I took them out of the package because every one of the little acorn accents fell off. With a little bit of hot glue, I was able to reattach them so it wasn't a big deal to me. I wrapped the tree with burlap ribbon and love the neutral look and feel of it. 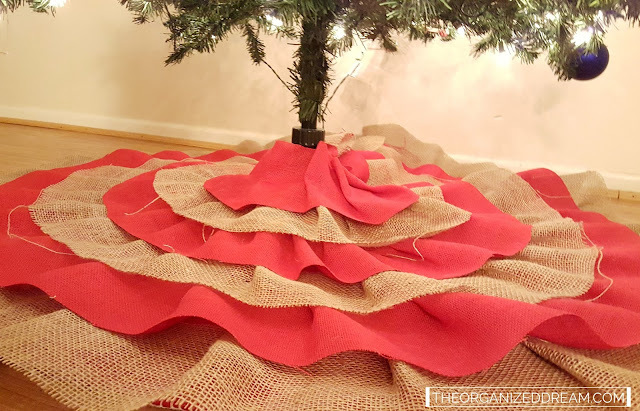 I needed a new tree skirt, too, so I took to Pinterest to find a tutorial on how to make my own ruffled tree skirt. They were all "no sew" and I really wasn't trying to sit there and hot glue burlap for hours so I simply folded over the burlap every so many inches and tacked it into place with some thread to my old tree skirt. I did this with just 2 rolls of burlap listed below. It only took me a couple of hours to do and if I decide that I want to go back to my old tree skirt next year, it's as easy as removing the tacked spots. Good as new! 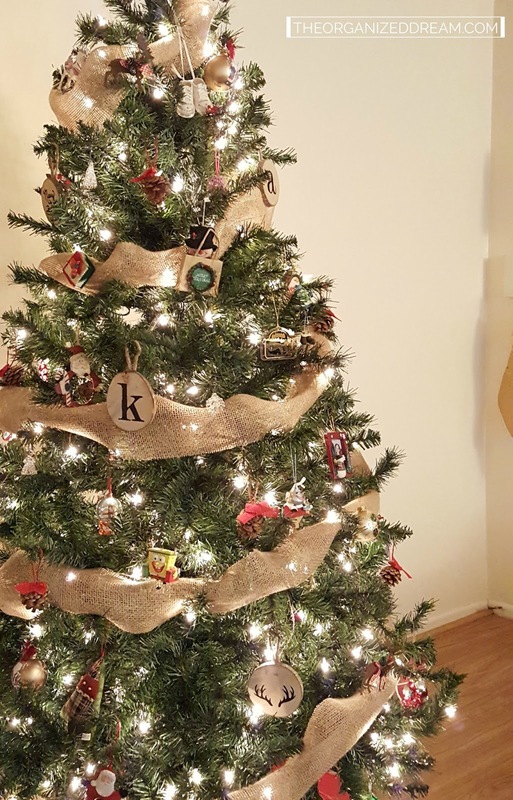 It isn't 100% perfect, but I think that is what adds to the rustic charm of the entire tree. I knew I needed a centerpiece for my coffee table and had these foam cones forever so I wrapped them in thick jute and accented them with deer antlers, lights and tree trimmings from my local park. The little Scrabble letter banner was made by gluing the letters to jute. Super simple! The planter box was fun to do. It came in a natural, unfinished light wood so I stained it. You can see my tutorial on how I stained it with craft paint here. 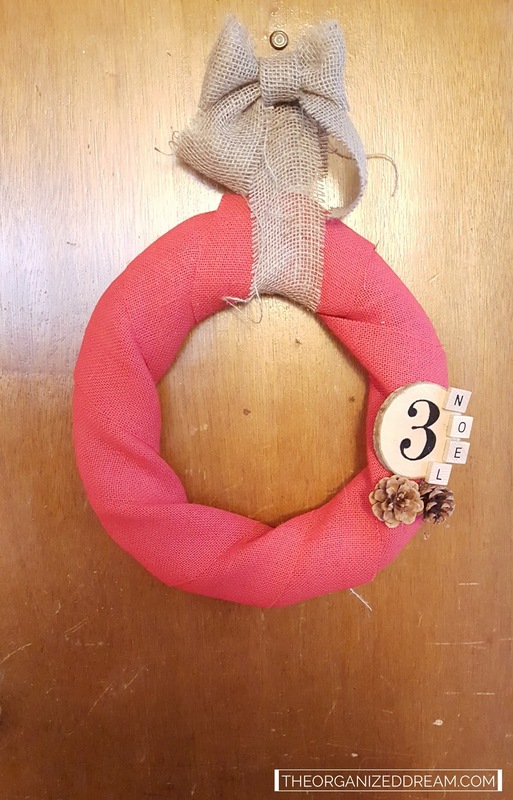 I had a bunch of red burlap left over so I thought "Why not make a wreath for the door?". I used a wire wreath frame and wrapped the burlap around it until I thought it was thick enough. With left over Scrabble letters, a wood slice and some pine cones, I accented it with my apt. number using the same stencil technique as the wood slice ornaments. I am really proud of myself for making such a pretty bow! I also made this wreath by wrapping jute around a foam wreath form. Again, so easy! 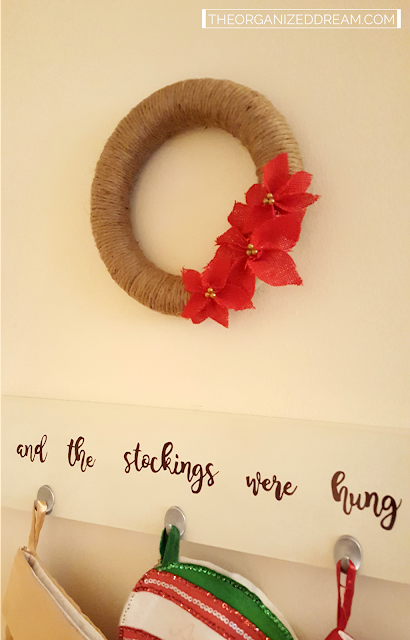 I made these Pointsettia flowers out of burlap. I have a tutorial on how to make these beauties coming up so stay tuned! Gosh, this was a long post, but there was so much to share (and I guess I got a little carried away!). 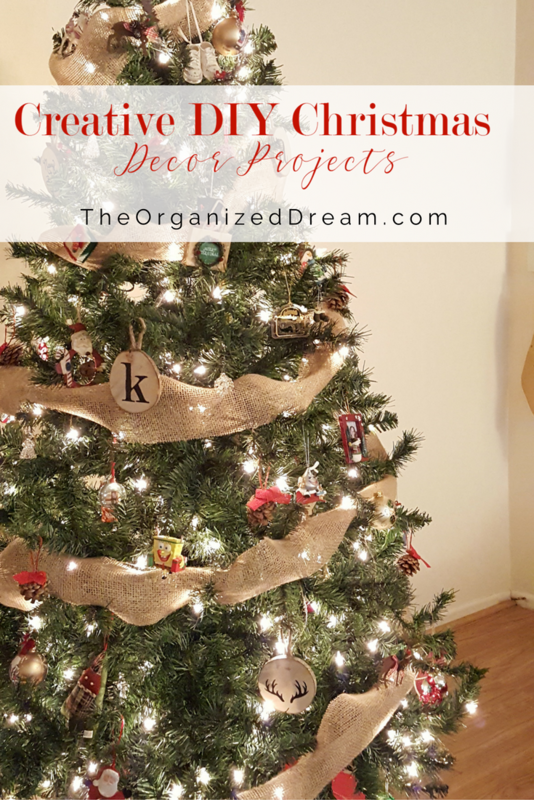 If you're interested in any of these fun projects, you can check out the list of supplies below, but don't forget to check out all of the other awesome Christmas craft supplies and decor that Oriental Trading has to offer. They have an amazing selection! Thanks so much for stopping by today and checking out the wonderful things I've made! Have you started crafting? Share your DIY below. I'd love to check them out! I love those moose ornaments!! 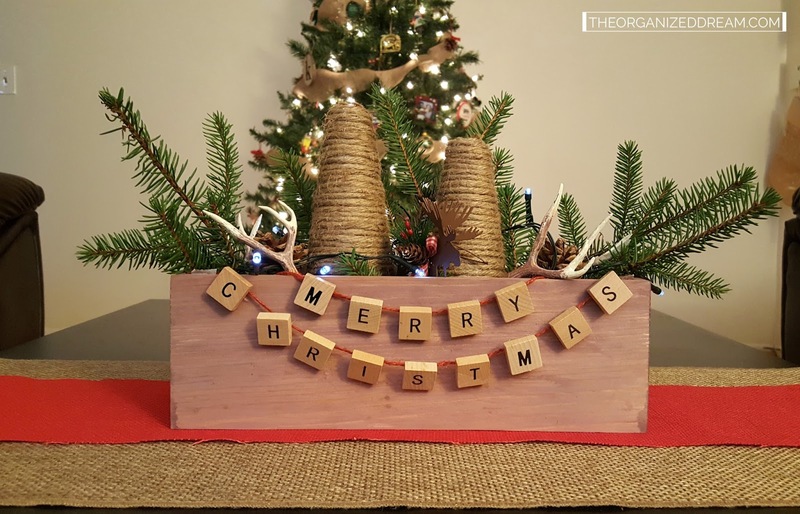 I don't have a rustic tree but I really want to think of a place to use those because they are awesome! Love Oriental Trading!